side in mist and poor weather. Smyth Hut, with ice-serac teeth crowning parts of it. From the lower reaches of the Ramsay moraine the route takes a fairly prominent buttress running directly to the low peak of Mt Whitcombe. Start on easy scree ledges which become progressively steeper with height – the last 60 metres below the summit is almost vertical. The rock is extremely rotten and subsequent rock fall has altered the route. This line has not been repeated due to its objective danger. From the Ramsay Glacier, take the obvious loose rock rib leading directly to the middle peak summit. Another route subject to constant rock fall. 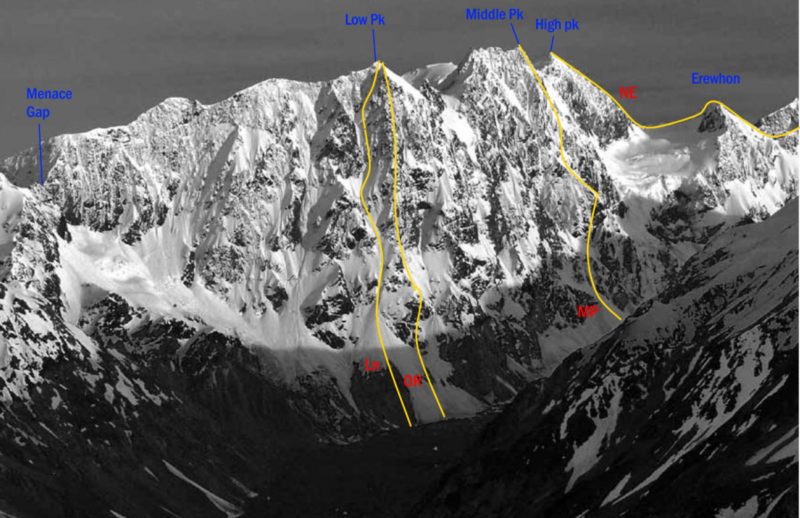 The original route on Mt Whitcombe was first climbed on what was planned as a bad weather reconnaissance. To reach the route from Erewhon Col, either climb over Erewhon Peak, staying more or less on the ridge, or sidle and drop down to the glacier (to about 2000 metres) on the north-west side of the Erewhon Col–Erewhon Peak ridge. Follow a glacial lead up to the col at 2330 metres between Mt Whitcombe and Erewhon Peak. The first part of the North East Ridge is a short, exposed, narrow arête, which can be climbed directly or bypassed on rock to the west. From here, stay on the crest of the ridge to the summit. The climbing is straightforward and the rock is generally okay. Descend the same way, or via Menace Gap, or over Snow Dome (can be tricky with no snow coverage). Accessed from the head of the Lornty Glacier. Graham McCallum and Beryl Matthews climbed a small peak just north of Mt Roberts, which may have been this peak, at Easter 1951. Accessed from the head of the Leeb Glacier. The first ascent party approached from Erewhon Col via the north ridge of Snow Dome, climbing the high peak of Whitcombe before dropping onto the Leeb Glacier for a simple snow and rock climb to the Middle Peak. Above the Essex flat in Vane Stream, continue on the true left. Go a little way up the Wilberg tributary before climbing the spur between the Wilberg and the stream draining Pt 1811 metres to the 1420-metre contour, then sidle into the Hazard Valley. Climb the snow slope leading to the Dainty Glacier, cross the Dainty to 1880 metres and gain the rock rib north. It is best to descend to the Lornty as soon as is practical. 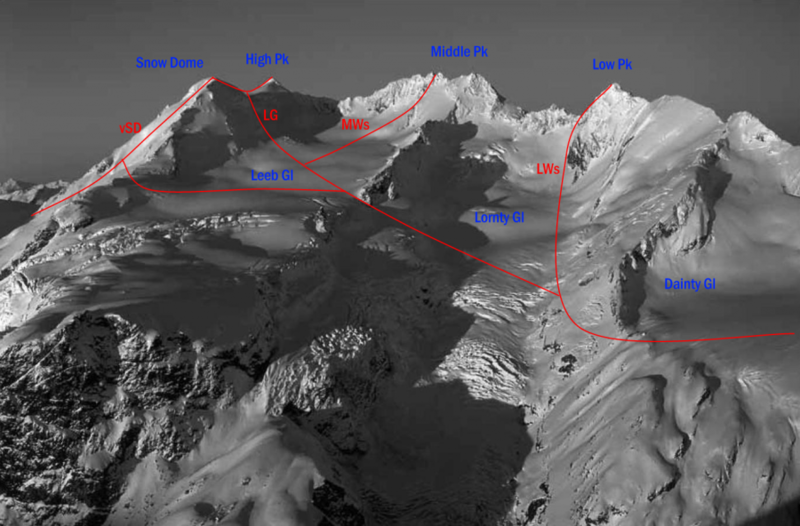 To gain the Leeb Glacier, aim for snow slopesbetween a loose rock pinnacle and a rock bluff extending up to the Divide. From the Leeb, the west ridge of Snow Dome can be accessed at 2240 metres or, more normally, climb snow slopes between Snow Dome and Whitcombe. A schrund usually cuts this slope off later in summer, and other schrunds appear on the ridge itself, but both peaks are otherwise easily accessible. From J34 374757 / BW18 275 140, head east up a dry gravel stream to the 1800-metre contour and continue to the ridge due north of Snow Dome. This ridge can also be accessed at 1840 metres from a glacier under Erewhon Peak. Diagonal back south-west through a minor band of bluffs at J34 397755 / BW18 297 139 to snow slopes and continue to Snow Dome as conditions dictate. From Snow Dome a broad snow ridge (often cut with slots later in the season) leads down and up to Whitcombe. Climbed when the face was snow-covered. 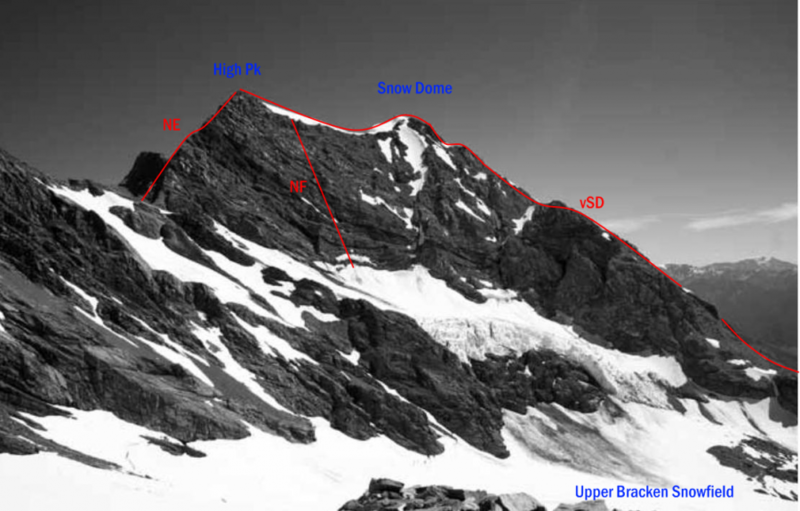 Begin in the left-hand snow cone and climb steep snow gullies to finish closer to the high peak.